Hashemi, M. and Hadjighassem, M. (2017). 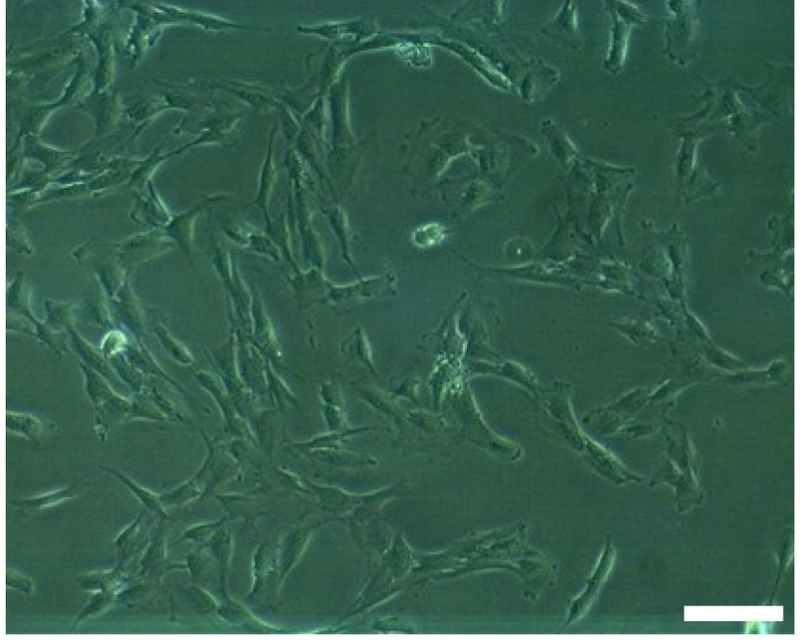 Primary Olfactory Ensheathing Cell Culture from Human Olfactory Mucosa Specimen. Bio-protocol 7(10): e2275. DOI: 10.21769/BioProtoc.2275. The human olfactory mucosa is located in the middle and superior turbinates, and the septum of nasal cavity. Olfactory mucosa plays an important role in detection of odours and it is also the only nervous tissue that is exposed to the external environment. This property leads to easy access to the olfactory mucosa for achieving various researches. The lamina propria of olfactory mucosa consists of olfactory ensheathing cells (OECs) that cover the nerve fibers of olfactory. Here we describe a protocol for isolation of OECs from biopsy of human olfactory mucosa. 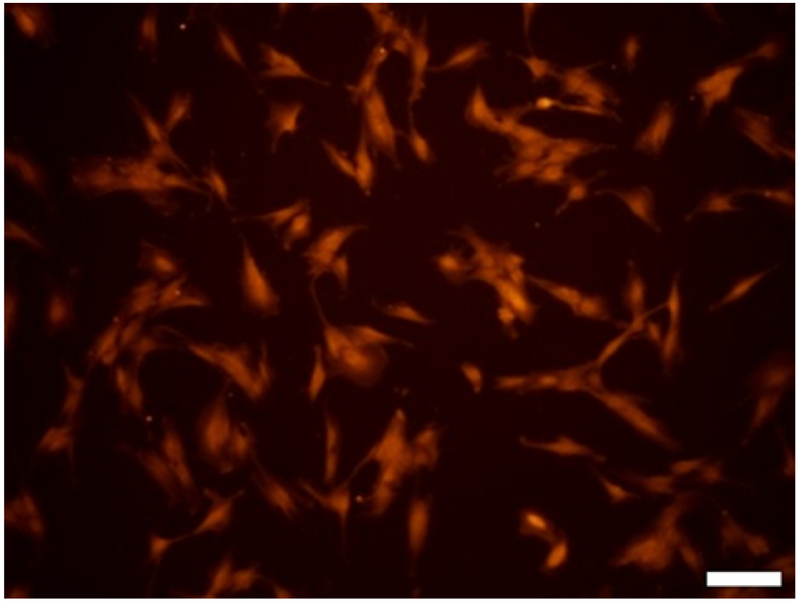 Olfactory ensheathing cells (OECs) are glial cells that express various antigens similar to astrocytes and Schwann cells such as glial fibrillary-associated protein (GFAP), S100-beta, p75 low-affinity nerve growth factor receptor, vimentin, nestin, and neuropeptide Y (Singh et al., 2013). Olfactory ensheathing cells release different neurotrophic factors and adhesion molecules that function in cellular growth and adhesions of central nervous system (Pastrana et al., 2007). In addition, these cells play an important role in the regeneration of the damaged central nervous system such as treatment of spinal cord injury and neurodegenerative diseases (Novikova et al., 2011). We select OECs as research material in our study as they have several advantage properties such as high migratory capacity, accessible source, differentiation from stem cells of nasal olfactory mucosa, and non-tumorigenicity behavior (Huang et al., 2008; Escada et al., 2009). This protocol describes a step-by-step procedure for the isolation of OECs from Human Olfactory Mucosa Specimen. A fresh sample (diameter of 4 mm) was obtained endoscopically from the superior turbinate tissue of a patient under general anesthesia. This study was approved by the Ethical Commission of the Tehran University of Medical Sciences. Before operation, a signed written consent was given by the patient. There is no age limitation for providing fresh sample in this study. After coordination with an Ear Nose and Throat (ENT) surgeon, the olfactory mucosa tissue was placed in a 15 ml tube containing 5 ml cold HBSS with 10% antibiotics (Antibiotic-antimycotic). Olfactory mucosa tissue was delivered to the lab on dry ice. Wash the olfactory mucosa tissue 3 times with 5 ml cold PBS each time. Incubate the olfactory mucosa tissue in 1 ml dispase II solution (2.4 IU/ml), for 1 h at 37 °C. Dissect lamina propria from the olfactory epithelium using a micro spatula under an inverted light microscope. Lamina propria is the thick orange layer and epithelium is the thin translucent gray layer. Cut the lamina propria into small pieces. Transfer the pieces to a new 15 ml Falcon tube containing 1 ml of collagenase IA and incubate for 20 min at 37 °C. Inactivate collagenase IA by adding 9 ml of PBS into the tube. Centrifuge the suspension at 250 x g for 5 min. Resuspend the resulting pellet in 1 ml of Dulbecco’s modified Eagle’s medium (DMEM)/F12 medium supplemented with neuronal growth factor (NGF, 50 ng/ml), 1% (100 U/ml) antibiotic-antimycotic. 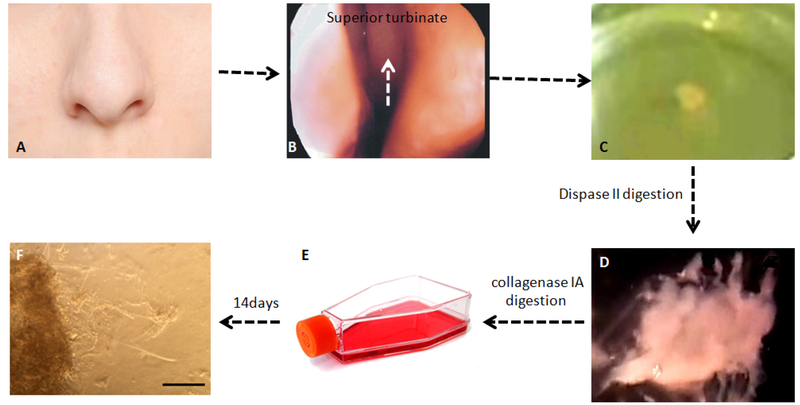 Transfer the suspension containing tiny pieces of tissue into two T25 flasks containing 5 ml of Dulbecco’s modified Eagle’s medium (DMEM)/F12 medium supplemented with neuronal growth factor (NGF, 50 ng/ml), 1% (100 U/ml) antibiotic-antimycotic each. Incubate in an incubator at 37 °C, 5% CO2 and 95% humidity for 3-4 weeks. Change culture medium every 3 days. After 3-4 weeks, OECs are ready for subculture. Figure 1. Different stages of OECs isolation from human olfactory mucosa. A. Outside view of nose; B. Location of superior turbinate in the olfactory mucosa; C. Human olfactory mucosa biopsy from superior turbinate; D. Lamina propria of olfactory mucosa after dispase II digestion; E. Lamina propria cultured after collagenase IA digestion; F. Olfactory ensheathing cells released from periphery of lamina propria, scale bar = 100 µm. Figure 2. OECs after first passage. Scale bar = 100 µm. Check the confluency of OECs under an inverted microscope. Subculture the cells when the cell density reaches 80% confluence 3-4 weeks after seeding. Remove the medium from each T25 flask under a biological hood with a 5 ml sterile pipette. Wash the cells with 3 ml of warm (37 °C) PBS and then remove PBS. Trypsinize the cells with 1 ml of warm (37 °C) 0.05% trypsin-EDTA for 1 min in an incubator at 37 °C. Stop trypsin-EDTA reaction by adding 4 ml of DMEM/F12 containing 10% FBS and 1% antibiotic-antimycotic into each T25 flask and then transfer the cell suspension from each flask to a 15 ml Falcon tube. Centrifuge the cell suspension at 250 x g for 5 min at room temperature. Remove the medium from each tube with a 5 ml sterile pipette. Resuspend the pellet in each tube with 1 ml of fresh medium containing DMEM/F12, 10% FBS and 1% antibiotic-antimycotic. After re-suspend and counting, seed the cells into a 24-well dish (at a density of 5 x 103 cells per well) for immunocytochemistry (go to step D2) and into T25 flasks (5 x 106 cells in flask) for subculture. Seed 5 x 103 cells into each well of a 24-well culture dish. Wash each well three times with phosphate-buffered saline (PBS) after 24 h at room temperature. Fix cells with 4% paraformaldehyde in PBS for 20 min. Wash cells three times in PBS at room temperature for 5 min each. Permeate cell membranes with 0.2% Triton X-100 for 15 min. Block cells with 10% bovine serum albumin for 1 h.
Dilute the primary antibody of rabbit anti-S100-beta 1:100 in 1% BSA in PBS. Dilute the secondary antibody of FITC-conjugated goat anti-rabbit 1:500 in 1% BSA in PBS. Incubate cells with secondary antibody of FITC-conjugated goat anti-rabbit for 2 h at room temperature in the dark. Image cells by an inverted fluorescence microscopy (Figure 3). Figure 3. Purified primary olfactory ensheathing cell culture. OECs have expressed antigen of S100-beta. Scale bar = 50 µm. Confirmation of cultured primary OECs was done by detecting S100-beta antigen via fluorescence immunocytochemical analysis. This analysis demonstrated that cells expressed S100-beta antigen. Test results are obtained from three independent experiments. Most steps should be performed in a sterile ventilation hood. All reagents should be pre-warmed at 37 °C before use. Exception is for washing olfactory mucosa tissue with cold PBS. If fibroblast contamination observed in the primary culture, cytosine arabinoside should be added to a final concentration of 5 µg/ml in the cell culture medium in the next 10 days. Cytosine arabinoside is a growth inhibitor of fibroblast. This study was supported by grant number 20035 obtained from School of Advanced Technologies in Medicine and grant 19925 from Brain and Spinal Cord injury Research Center, Tehran University of Medical Sciences. The protocol was adapted from Hashemi et al. (2016). Escada, P. A., Lima, C. and da Silva, J. M. (2009). The human olfactory mucosa. Eur Arch Otorhinolaryngol 266(11): 1675-1680. Hashemi, M., Fallah, A., Aghayan, H. R., Arjmand, B., Yazdani, N., Verdi, J., Ghodsi, S. M., Miri, S. M. and Hadjighassem, M.R. (2016). A new approach in gene therapy of glioblastoma multiforme: human olfactory ensheathing cells as a novel carrier for suicide gene delivery. Mol Neurobiol 53(8): 5118-5128. Huang, Z. H., Wang, Y., Cao, L., Su, Z. D., Zhu, Y. L., Chen, Y. Z., Yuan, X. B. and He, C. (2008). Migratory properties of cultured olfactory ensheathing cells by single-cell migration assay. Cell Res 18(4): 479-490. Novikova, L. N., Lobov, S., Wiberg, M. and Novikov, L. N. (2011). 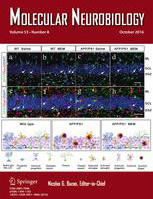 Efficacy of olfactory ensheathing cells to support regeneration after spinal cord injury is influenced by method of culture preparation. Exp Neurol 229(1): 132-142. Pastrana, E., Moreno-Flores, M. T., Avila, J., Wandosell, F., Minichiello, L. and Diaz-Nido, J. (2007). BDNF production by olfactory ensheathing cells contributes to axonal regeneration of cultured adult CNS neurons. Neurochem Int 50(3): 491-498. Singh, N., Gopal, S. C., Srivastava, R. N., Chandra, T., Agarwal, S. P., Singh, S. K., Gupta, D. K. and Balapure, A. K. (2013). In vitro maintenance of olfactory mucosa: with enriched olfactory ensheathing cells. J Stem Cell Res Ther 3:1-8. How to cite: Hashemi, M. and Hadjighassem, M. (2017). Primary Olfactory Ensheathing Cell Culture from Human Olfactory Mucosa Specimen. Bio-protocol 7(10): e2275. DOI: 10.21769/BioProtoc.2275.